When I look back, I realize that God was preparing me to open SweeTea's over the years. My first part-time job in high school was in the china department at The Emporium in downtown San Francisco. Who would have thought that over 30 years later, I would still be surrounded by fine china plates and tea cups! 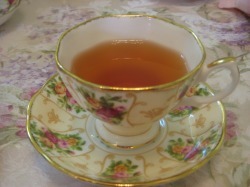 I started collecting English tea cups about 10 years ago. It also became my hobby to visit tea rooms in the United States and Canada. In 2002, my two older sisters and I took a trip across the pond in search of teacups and to experience tea time in merry old England. The delightful thing about going to tea is that the experience is different in every tea room. Each owner's personality comes though in the decor, food and tea selections. At SweeTea's, I have tried to create a comfortable and elegant atmosphere in a country setting. SweeTea's is nestled in the corner of a charming courtyard on West 25th Avenue in San Mateo. We are a serendipitous treat for those who find us. We offer full traditional tea service including cream teas, dessert teas, luncheon and full afternoon tea meals. We make all of our menu items using the freshest ingredients available. We make our scones and desserts from scratch every day. After being in the financing and leasing industry for 20 years, I wanted to do something that would touch people's lives. When someone steps in the tea room, I welcome them as if they were stepping into my home. I strive to give every customer an enjoyable tea experience. Our motto is "You might enter the tea room as a stranger but you will leave as our friend." And since opening our doors in October 2007, I've made hundreds of new friends! We hope you will visit soon and experience tea with us.